Large home painted with 3 colors; tan stucco, cream trim and black accents. When painting the exterior of your home, there are a few different things that you will want to consider before getting started. Choosing exterior paint colors is a step in the remodeling process that takes a great deal more planning than you would think, as you will have to visualize what the end product will look like. It is important to consider a number of different aspects before coming to a final decision, so make sure that you are able to separate yourself from choosing your favorite exterior paint colors and go with a color that will make your home look fantastic for years to come. The first thing that you must do is come up with a list of paint colors that you like. You would not want to end up with a color that you despise because that will just lead to you fretting your return home every day. These colors will be the last thing that you see when you leave your house in the morning and the first thing you see when you return, so it is absolutely vital that you choose colors that will not make you depressed and will not grow old on you very quickly.Another thing to consider is which exterior paint colors appear to be popular in your neighborhood. While choosing exterior paint colors that you enjoy is important, it is also a good idea to consider what other people are doing because you could end up standing out in a bad way. For example, if everyone on your street has homes with earth-toned colors, it would not be wise for you to paint your home bright orange because it will become an eyesore and everyone in the neighborhood will resent you because of it. Two other considerations are selling your home and the home owners association. If you are or plan on selling your home anytime soon it is best to use neutral colors without a striking contrast to your neighbors. Try to choose complementary paint colors to your neighborhood but have some differences so your home stands out a little. Your choices might be limited by the homeowners association. Have 2 or 3 different color schemes and paint swatches ready to submit. Take your home’s fixtures into account when selecting an exterior paint color, as these items cannot be changed in color very easily. Take particular notice if your home has brick, stone, or stucco, as the colors that you choose should complement these items. While white stucco will go well with just about any color, red brick will not, so your choices will have to be altered accordingly. Other items on the list are factory finished windows, gutters and doors. Most of these items can be painted but this will add to the scope of work and cost. Once you have made these comparisons, it is time to narrow down your choices considerably. Some colors will have automatically eliminated themselves from consideration by being too bright or by clashing with other colors on your home or in the neighborhood. Once you have narrowed your list down to colors that will actually look good, you can begin the process of coming to a final conclusion on colors. Also, make sure that you take your overall budget into consideration when selecting these colors, since exterior items that are not fixtures might need to be replaced. Once you have narrowed down your colors, you can make your final selection. As was mentioned previously, factors like the color of your pre-finished front door, windows garage door and roof will need to be considered. If you are going to a lighter color, your dark brown door might not do anymore, so it will have to be repainted or stained accordingly. The same can be said for a prefinished garage door, as its color should be the same as the rest of the home, as this will make your home look larger. The roof will work with most colors that you choose, although the wooden shakes that were popular in years past do have some problems with some colors. It is a good idea to take some samples home from the paint store and hold them up against these fixtures. If you do not like what you see, it is always a good idea to move onto another of your preferred colors. At this point, you will be able to begin choosing where you will want to place each color. 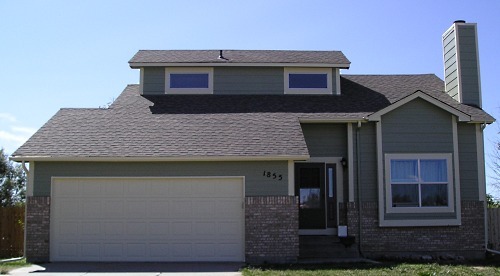 You will want to decide on which color will be used for the siding, the trim and accents. The field color is the largest area. Think of this as the canvas that the other colors will be put against. It is best to have a neutral background color that goes well with any fixed unpainted features. Lighter colors tend to make a home look larger while darker colors do the opposite. The trim color will be used on the fascia boards, gutters, window trim and possibly entry doors. This color will provide your home with the color continuity that will make it look outstanding. Generally, the trim paint color defines the architectural details of you home. You can take more risks with this color as it isn’t as prominent as the main house color. For color continuity your doors and window frames could match the trim color. Exterior accent colors are used sparingly to draw attention to specific areas and add a little extra splash of color. Good places for a bold color are the front door and shutters. Finally, make sure that you choose exterior paint colors that will last, as the color that you select will help determine how long the paint stays looking fresh. Generally, darker colors will begin to fade faster because they absorb more heat and experience more problems with UV light. Because of this, you will get better value out of lighter colors and, luckily, these lighter colors appear to be the most popular currently. That is not to say that you should make your decision purely based on how long the colors will last, but it is definitely something that should be considered in your decision. In the end, choosing the exterior paint colors of your home is an important decision for you to make because it is an investment that you will have to live with for years to come. Take the time to decide on this properly, rather than making a quick decision, and you can save yourself a great deal of hassle in the future. This is your house and by painting the exterior with colors that you love, you can truly make it into a home.